The total amount raised for charity by Haverhill’s first half marathon and 10k races has been totted up and stands at a staggering £13,000. HaverHalf and Haver10 were held on May 11, and more than 350 runners took part to raise £13,407.16 for St Nicholas Hospice Care. 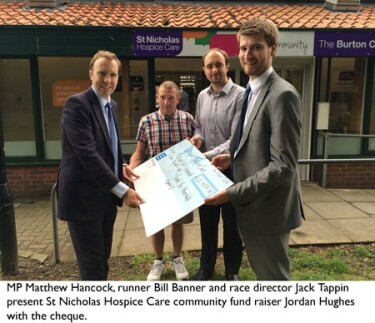 Race director and organiser Jack Tappin, along with West Suffolk MP Matthew Hancock and Michael Banner, who between them raised more than £5,500, presented the cash to the hospice on Friday. The races were made possible thanks to funding from Sanofi, Real Bodied Health and Fitness gym, Suffolk County Councillors Anne Gower, Tony Brown and Julian Flood, Haverhill Town Council and ONE Haverhill. Stylize Display Graphics, GreenAir Cars, OS Communications, Perform Sports Therapy, Digital Print Shop and Castle Manor Academy also provided essential support. Mr Hancock set off Haver10 before completing his first half marathon in 1hr 50 minutes. The skills minister, who raised around £4,000 for the hospice, said: “The fact we have managed to raise over £13,000 on the first attempt of HaverHalf is a triumph. "It's a tribute to Jack Tappin, St Nicholas Hospice Care and everyone who entered, helped or donated. "It shows the strength of community spirit in Haverhill that the town backed this now annual event with such gusto. "My next challenge is HaverTri, which I'm looking forward to. "The amount of doors to go to and driveways to walk up for the election should make me super fit for HaverHalf next year." Michael Banner, 48, from Helions Park Avenue, was competing in his first half marathon having only begun running less than a year ago. He raised more than £1,500 for the charity. "As I live in Haverhill I wanted to make this my first race because it was a local run for a local good cause," he said. "I'm really pleased with how much I raised, which is more than I expected. "I found the race enjoyable, though it was tough going up Roman Way. I'm looking forward to next year's race." Mr Tappin is now planning to bring the events back to Haverhill next year on separate days and see support for them and the amount raised for charity grow further still. “When I set out to organise these races I hoped to attract 200 runners and raised a couple of thousand for charity”, he said. “We ended up having more than double that number of runners and raising a breath-taking amount for St Nicholas Hospice Care. “Feedback has been overwhelmingly positive with the vast majority of runners hoping to compete again next year. “I’m now working towards bringing these races back to Haverhill as two separate events and raising many more thousands for charity. Jordan Hughes, community fund raiser for St Nicholas Hospice Care, said: "I'm absolutely thrilled to have seen Haverhill take this on and make it a success, with not only people from the town but also from outside the area. "It's been great to establish such an event in Haverhill, particularly in a year we celebrate our 30th anniversary and open our first outreach centre in the town. "We look forward to seeing the events grow in the future and raise many more thousands for St Nicholas Hospice Care." 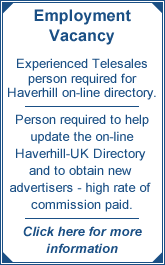 Part of the legacy of HaverHalf has been to bring triathlon to Haverhill for the first time. HaverTri – the Haverhill Research Park Triathlon, will be held on Sunday, October 5, with three distances of race available at Haverhill Leisure Centre. The triathlon, which will be raising money for Haverhill Scouts and Guides, can be entered at www.entrycentral.com/havertri, or by collecting an entry form from Haverhill Arts Centre or the Leisure Centre. For more information or to volunteer, e-mail haverhalf@gmail.com, or follow the race on Facebook or Twitter. Mr Tappin added: “I’m hoping HaverTri and other events can hope to raise thousands more for other local charities. ‘Half Way There’, the documentary that chronicles how HaverHalf and Haver10 grew from a concept to being realised, was filmed by the Haverhill Man Alive team including Ron Walker and Gary Pontin throughout the organisation and execution of HaverHalf.